No. 3 Indiana Wesleyan University men's basketball overcame another double digit deficit in the second half to defeat No. 11 Mount Vernon Nazarene (Ohio) 76-70 to win the program's fourth Crossroads League Tournament Championship. It is the first back-to-back tournament title for the Wildcats who have won all four titles within the last 10 seasons. Indiana Wesleyan trailed 47-37 with 16:45 to play in the second half. That is when IWU ran off a 15-4 run to gain a 52-51 advantage just four minutes later. That spurt was not the key stretch of the game as that began on an Isaac White turnover with 7:31 to play and MVNU clinging to a 65-60 lead. That was the first of 11 straight empty possessions for Mount Vernon Nazarene. Indiana Wesleyan took advantage of the drought and scored 12 unanswered to claim a 72-65 lead with 1:12 to play. Overcoming a double-digit lead in Luckey Arena has become somewhat common for the Wildcats. IWU has trailed by 10 or more points and still won the game on four occasions this season with wins over Indiana Tech, Bethel (Ind. ), Marian (Ind. ), and now Mount Vernon Nazarene. IWU overcame a 17-point deficit in both halves on Saturday vs. Marian. The defense keyed the championship victory but the offense also hit another gear in the final 20 minutes. Indiana Wesleyan connected on 65-percent of their shots (17 of 26) during the period as Kyle Mangas came on strong in the half with 20 of his game-high 25 points. 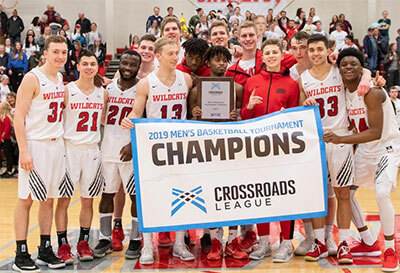 The Wildcats have won Crossroads League Tournament championships in 2010, 2015, 2018, and 2019. IWU improves to 27-5 at Luckey Arena in the tournament and are winners of 13 straight tournament home games. The Wildcats have won six straight Crossroads League Tournament games and 11 straight postseason games overall. The last postseason loss came to Union (Ky.) in the 2017 NAIA National Championship Semifinals. IWU is 13-2 in the Crossroads League Tournament dating back to 2015 and 22-7 since 2009. The back-to-back titles are the first in the Crossroads League since Bethel accomplished the feat in 2013 and 2014. "It never gets old winning championships with a group of guys that journey through a season and being able to watch them grow. When I saw Trevor Waite taking those charges and Joel Okafor (5'11''-PG-96) giving his heart tonight, that is the joy and fun in coaching." "We had 11 straight stops in the second half. That started with Trevor Waite taking those charges. When you have guys step up like that and give his body for the team, everybody buys in. I am really proud of Trevor tonight." "I love our second half effort. There was grit and determination." G: Jevon Knox (6'2''-G) of Mt.Vernon Naz. G/F: Brett Vipperman (6'5''-G/F) of Mt.Vernon Naz. F: Logan Godfrey (6'7''-F) of Grace Coll. Haden Deaton (6'5''-F) of Grace Coll. G: Jeremiah Roberts (6'5''-G) of Mt.Vernon Naz.